Archimedes (c. 287 BC - c. 212 BC) approximated the area of a circle along with its circumference by the increasing sequence of inscribed regular polygons and the decreasing sequence of curcumscribed ones. Rabbi Abraham bar Hiyya Hanasi (11-12 centuries) thought of the interior of a circle as consisting of layers (onion-like) of smaller circles and computed its area by flattening those layers. In the 17th century Mochinaga Ohashi [Smith and Mikami, p. 139] filled a semicirlce with a staircase of rectangles of decreasing height. Leonardo da Vinci (April 15, 1452 - May 2, 1519) [Beckman, p. 19, Smith and Mikami, p. 131]. 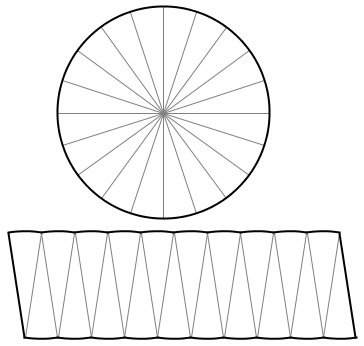 The applet below illustrates the method of da Vinci and Sato Moshun, both of whom used a double amount of sectors to compose an curvilinear parallelogram. In the applet, we use the exact amount of sectors cut off a single circle. The difference is twofold. For an odd number of sectors the figure we obtain is rather a curvilinear trapezoid than a parallelogram. The advantage is that the sum of the curvilinear lengths (of the two bases) is exactly the length of the circumference of the circle. Regardless of the method, the height tends to the radius of the circle, giving in the limit 2πr/2·r = πr². Presently, in Windows only Firefox runs Java applets and that after setting up in Java the site they are coming from as trusted.